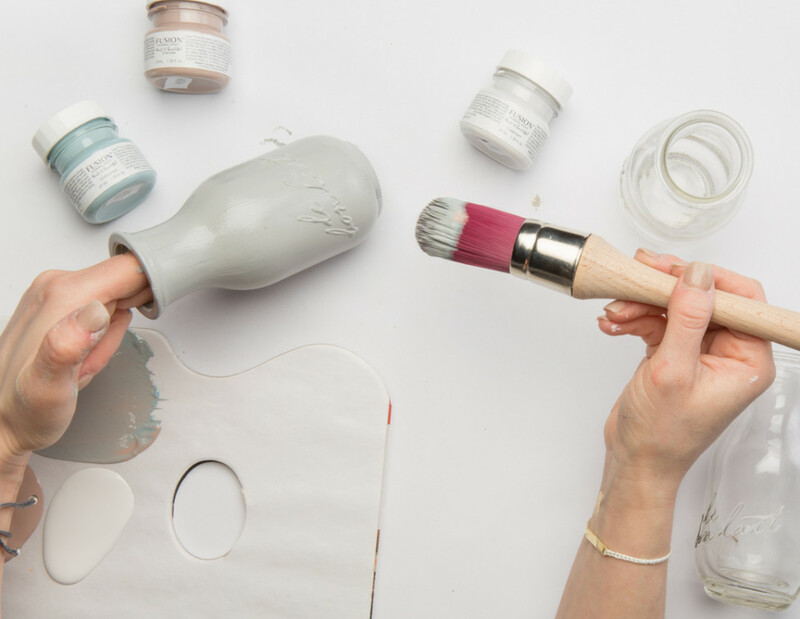 The perfect craft that you can customize in the paint colors of your choice! 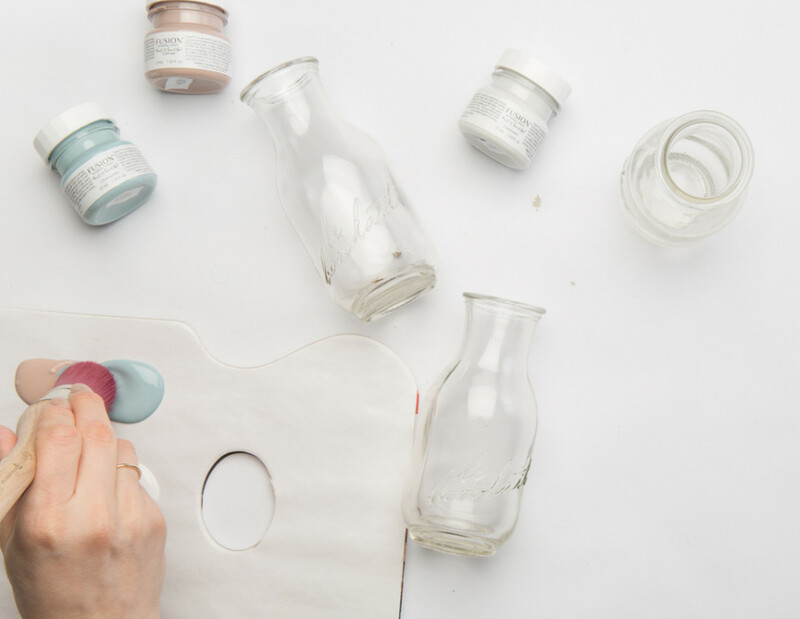 Whether you’re excited about Spring or planning an event such as a wedding or a party, we have a super easy craft that you can make and personalize the colors to match your home decor or event theme – painted glass jars! Think centerpieces, vases and table settings! 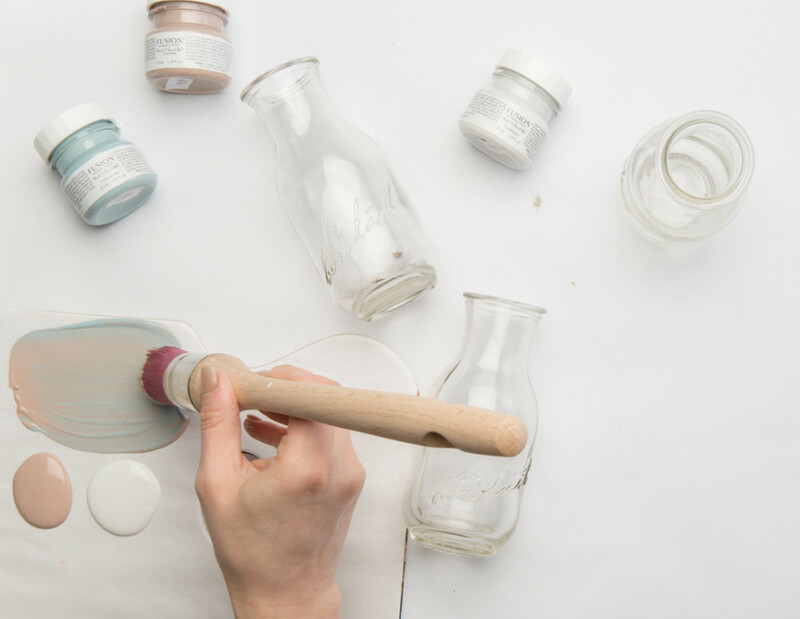 Now, painting glass always seems daunting but with Fusion Mineral Paint, we make it super easy to paint glass bottles and other substances for that matter. Yes, Fusion adheres to more than just wood. 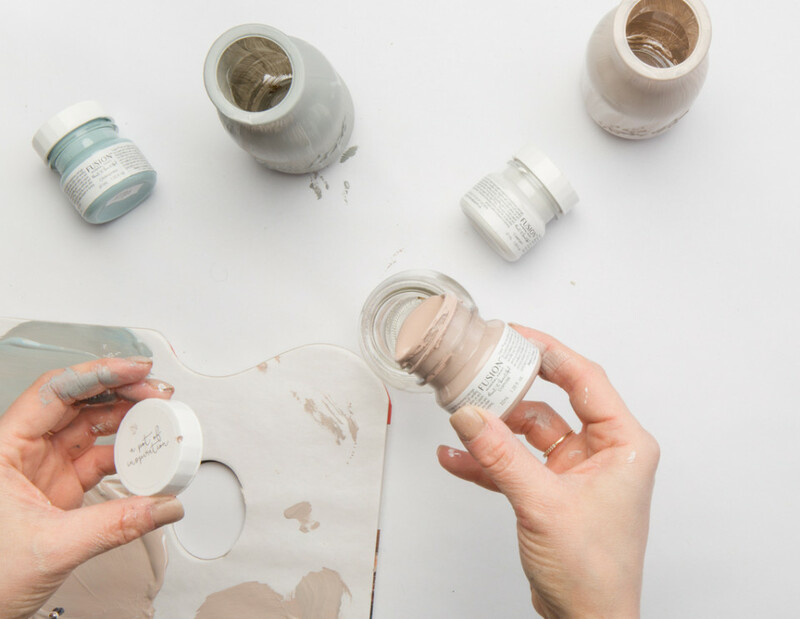 We’ve painted melamine cabinets, wood, metal and even tiles – our YouTube channel is filled with great tutorials on how to paint these surfaces and more. 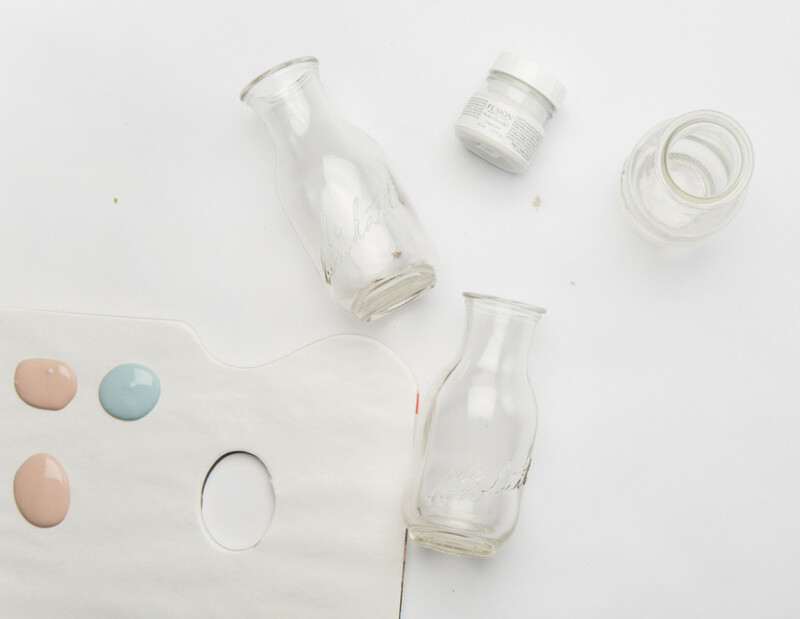 The most important part of this DIY is making sure your glass bottles are CLEAN! This could mean running them through the dishwasher, or scrubbing them by hand with hot water and soap. You want to make sure they are squeaky-clean so that Fusion has a good, solid surface to adhere to. 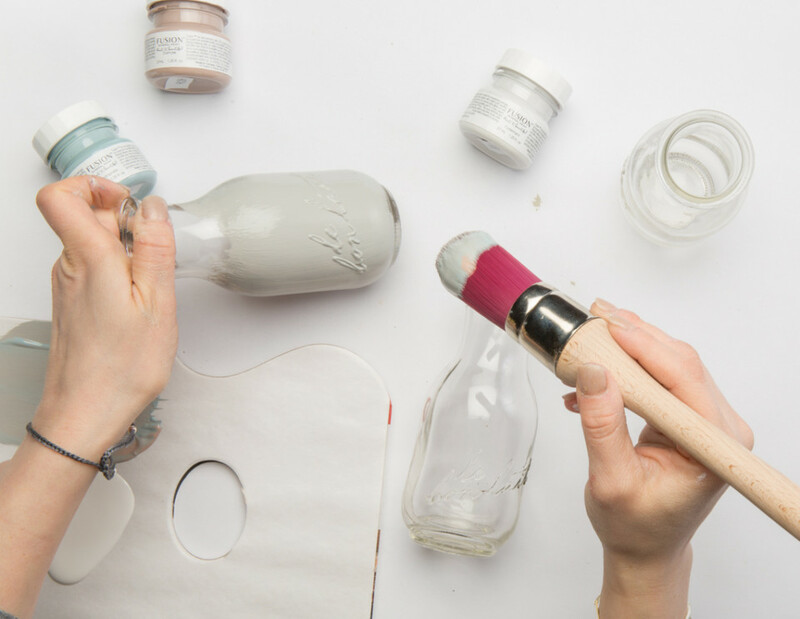 We’re going to show you two ways to paint your glass bottles. The first is the exterior surface of your bottle. 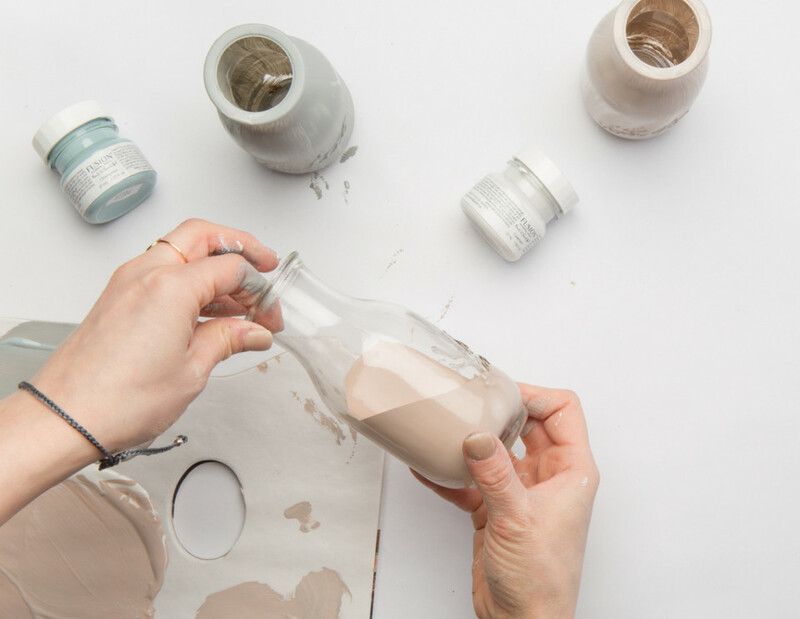 This look lends itself to a more french country meets shabby chic look and is actually perfect if you want to use a stencil on the surface or create a pattern with tape on the bottles. If you want to create an aged look by lightly sanding the surface letters (which are often seen on glass mason jars) this is also the way to go. We did a custom color mix for our jars. One jar was a 50/50 mix of Champness and Damask and the other was a 50/50 mix of Damask and Casement. 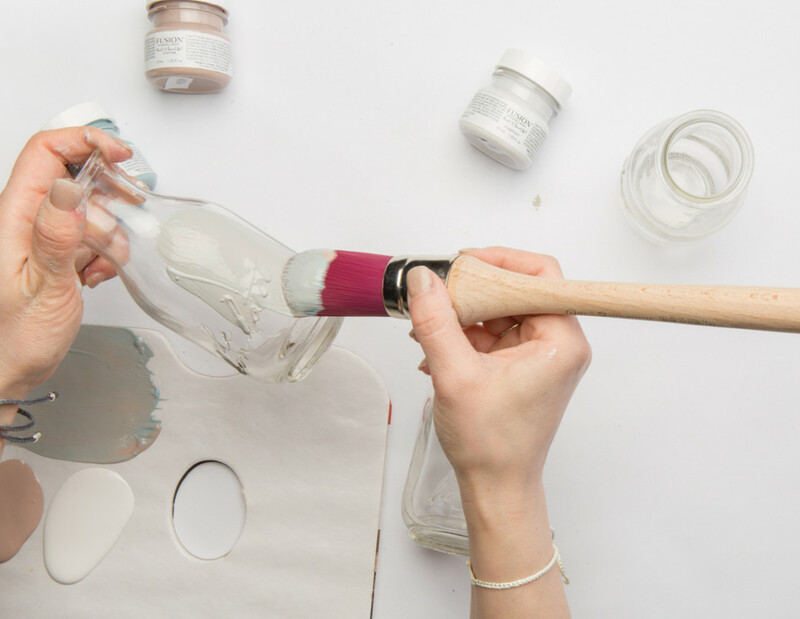 Just mix your paint and gently apply to the surface of your glass bottle using your Staalmeester paint brush. Their Ultimate ONE synthetic brush series are our favorite brushes as they offer the best brush stroke free finish. You do not need any major prep. Just make sure the glasses are clean without residue or any sticky substances and you do not need to use Ultra Grip as Fusion adheres to glass very easily. After you are done painting, just leave it to dry overnight. It will be dry to the touch in a couple of hours if you’re in a rush. Let’s say you want a more refined look for your jars, it doesn’t get much easier than this. 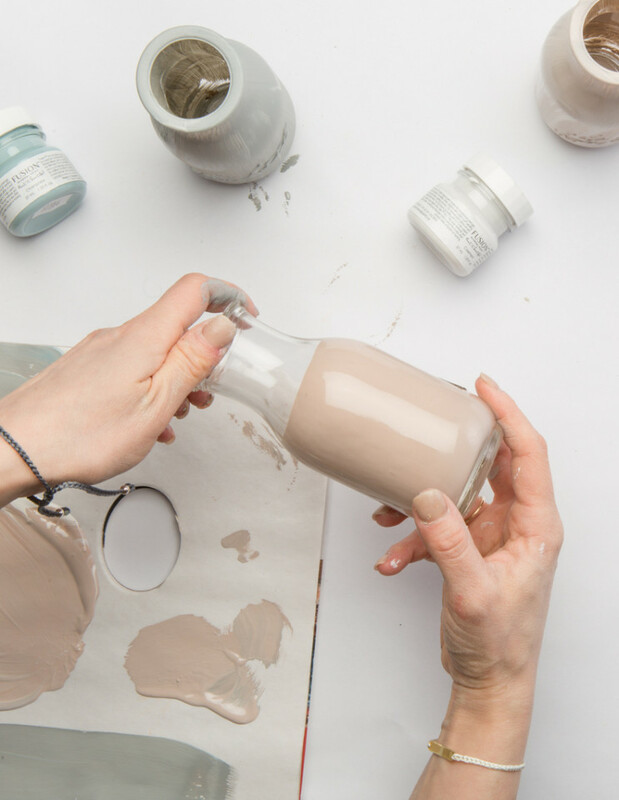 Take some Fusion Mineral Paint and pour a tiny amount into your glass bottle, then swirl it around until the inside of the bottle is coated. Leave it to dry and that is it! A tester sized pot of Fusion is perfect for trying this out on. A little paint goes a long way for this and shortens drying time as your paint won’t pool inside and take longer to dry. 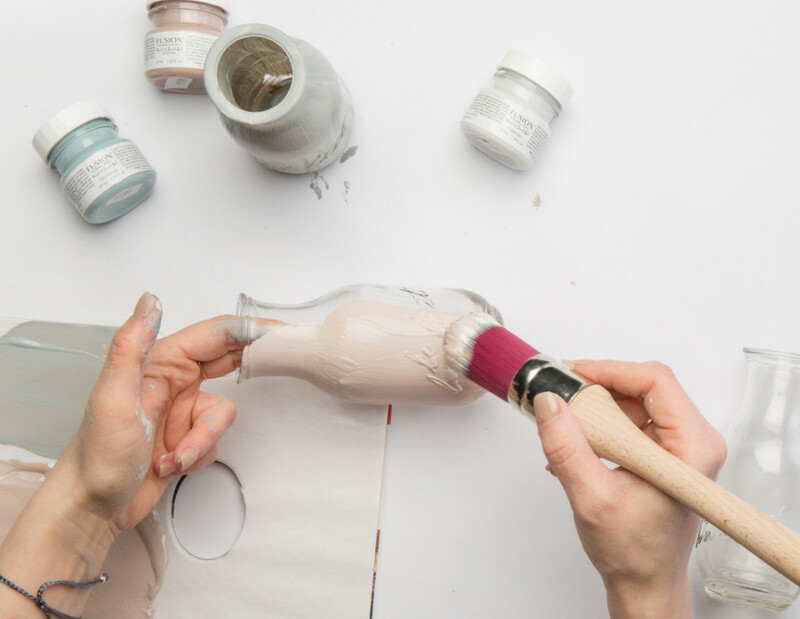 We like to leave the bottles standing right side up (meaning the bottle opening is at the top as if you put a vase on a table) as this way it prevents the paint from dripping out onto your surface and sticking to it. This may cause the paint to not dry as cleanly around the edge of the opening, leaving the potential for flaking off paint. Use your jars for your table displays or centerpieces and fill them with gorgeous flowers to brighten up your home! 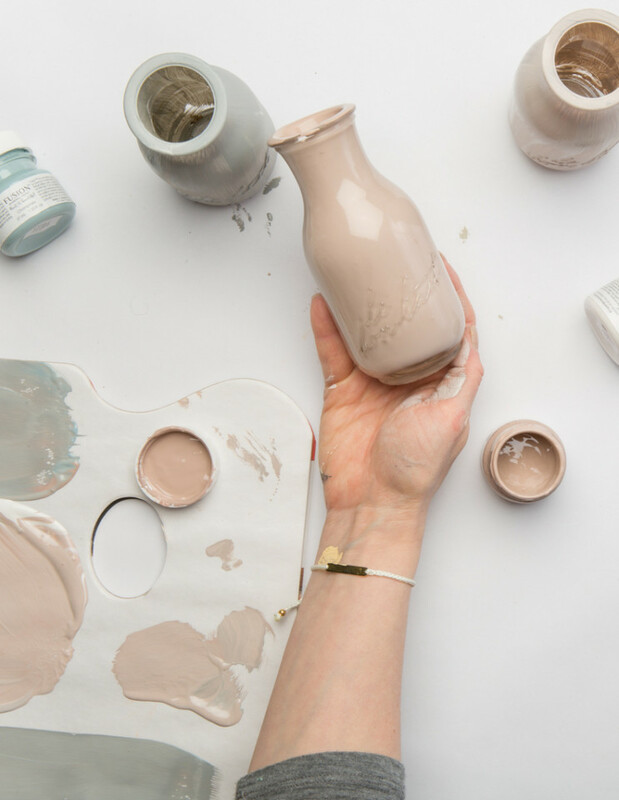 And share your craft projects with us by tagging us on social media using #FusionMineralPaint and #PaintItBeautiful and posting in our Paint it Beautiful Facebook group.